*Please note you need to acknowledge the red envelopes tradition before you use this cure to sell the house. Because this is a secret BTB feng shui cure, the tradition is to give red envelopes when the info is received. As we are communicating online, be sure to read the red envelopes tradition; this will be our way of honouring the wisdom of this secret feng shui cure. A water brook or a lake can work too; alternatively you can perform this cure at the seashore (best in a secluded spot). Note: Be sure to use the spare key, and not your only key to the house! It is also best to perform this cure alone, as well as have some time before and after it to spend by yourself. Step by Step Instructions: Plan this cure ahead of time to be sure you can be by the body of water during the most powerful hours of the day (11AM – 1PM). Before leaving home, spend some time in the center of your house, also called the heart of the home and connect to your strong intent to let the house go and sell the house. Be sure to hold your spare key in your hands and focus on energizing it with your intent to sell the house. If you are sincere with this cure, you will start feeling quite strong emotions and maybe have clear insights as to why the house is not selling (in most cases, there is always an emotional blockage, or attachment that prevents the house sale). This strong attachment might be yours, or any of your family members. Spend as much or as little time you need in the center of your home; you might also choose to take a tour of the house, if this feels right. Find your own, personalized way of saying good bye to the house and letting go of your attachment to it. Be sure to hold your spare keys in your hands all this time. When you feel you are ready to leave, use the key to lock and unlock the front door of your house. Be sure to do this several times, especially if the spare key you are using for this feng shui cure has not been used in a long time. When ready, find your way to a natural body of water. The next step is a bit of a mystical one. Basically what you do is stand on the bank of the river, hold your house key with both hands while fuelling/energizing it with the force and clarity of your intent to sell the house. You can also close your eyes and say a prayer, or just spend a bit of time reliving the strongest memories and experiences lived in the house. This is a very personal step, so feel free to personalize it in a way that feels most powerful to you. It is also one of the most important parts of this secret feng shui cure, because what you will do next is … throw the key into the river! Yes, this is the next step. 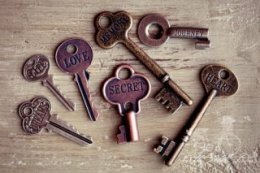 It is about letting your attachment to the house go totally and completely as energetically the key does not belong to you anymore; you allow the flow of universal energy to take the house key to its next owner. Of course, you do understand that this is certainly not about an actual person finding your actual key in the river and getting your house. It is a powerful symbolic gesture, an outer manifestation (and an ancient one, too!) of the “Let go and let God” step. You might feel strong emotions when throwing your key into the water, you might also feel a strong resistance and even change your mind. Watch your reactions, as they will tell you a lot about the present energetic blockages in selling your house.